New records of Ipomoea chiquitensis J.R.I. Wood & R.W. Scotland were discovered for the states of Ceará, Piauí, and Rio Grande do Norte, in northeastern Brazil. The species was recently described from the Chaco region in Bolivia, and is reported herein to occur in “Caatinga” vegetation. We present a brief description, distribution map, potential distribution modeling, illustration, photographs, and a comparison with related species. Se descubrieron nuevos registros de Ipomoea chiquitensis J.R.I. Wood & R.W. Scotland para los estados del Ceará, Piauí y Rio Grande do Norte, en el noreste del Brasil. La especie fue descrita recientemente en la región del Chaco en Bolivia y ahora se encuentra aquí en la vegetación de la “Caatinga”. Se presenta una breve descripción, mapa de distribución, modelado de distribución potencial, ilustración, fotografías y una comparación con especies afines. Convolvulaceae comprise 62 genera and nearly 1,900 species, mostly distributed in the tropics (Simões & Staples, 2017; Staples, 2017). In Brazil, more than 400 species are known in 24 genera (BFG, 2017). The family is represented mainly by climbing plants that grow in areas with a high incidence of sunlight, such as savannah vegetation and forest borders (Staples, 2012). The most diverse genus —in terms of number of species and morphological variation— is Ipomoea L., which includes more than 700 taxa (Staples, 2012). In Brazil, around 150 species are currently known, of which more than 1/3 are endemic, and occur in different vegetation types (BFG, 2017). The genus is characterized morphologically by a single style with bilobed stigmas, pantoporate and echinate pollen grains, and by the fruit that is a dehiscent capsule (Simão-Bianchini, 1998), otherwise being extremely variable in habit, leaf shape, and corolla shape or color. Ipomoea chiquitensis is a recently described species from Bolivia, and is considered endangered (Wood et al., 2015). During an ongoing project to improve the knowledge of Convolvulaceae from Brazil, we made field expeditions in the Brazilian northeast region between 2015 and 2016, when we collected a specimen that we came to conclude belonged to this species. It is the first record of I. chiquitensis for Brazil. 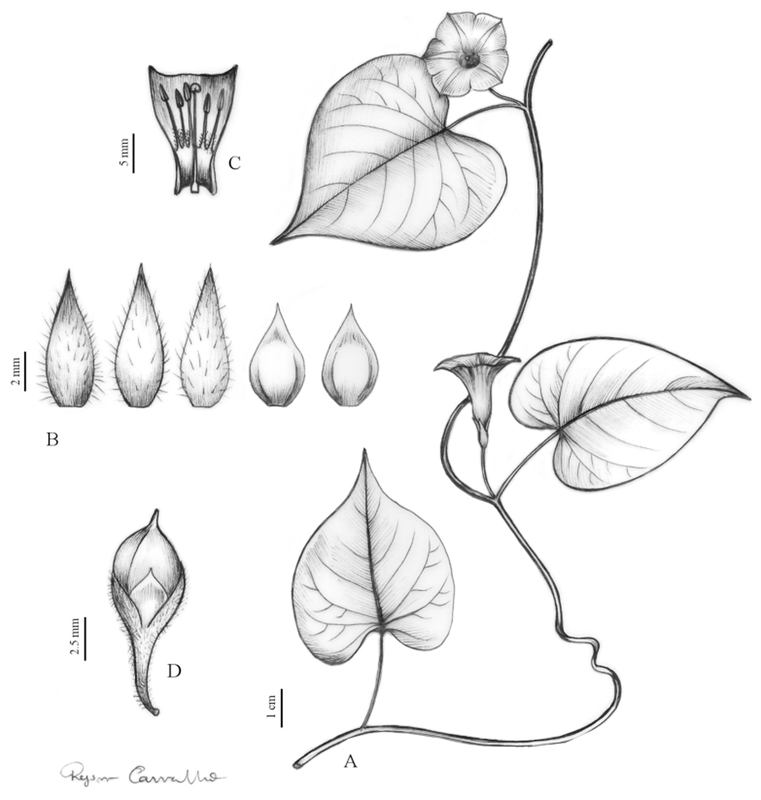 More extensive study of herbarium collections revealed that this species is more frequent than initially thought in Brazil, only its specimens have been identified in herbaria as other species of Ipomoea. In this work, we provide an extended and taxonomic treatment for I. chiquitensis, to include the newly reported Brazilian occurrences, and we re-assess its conservation status. 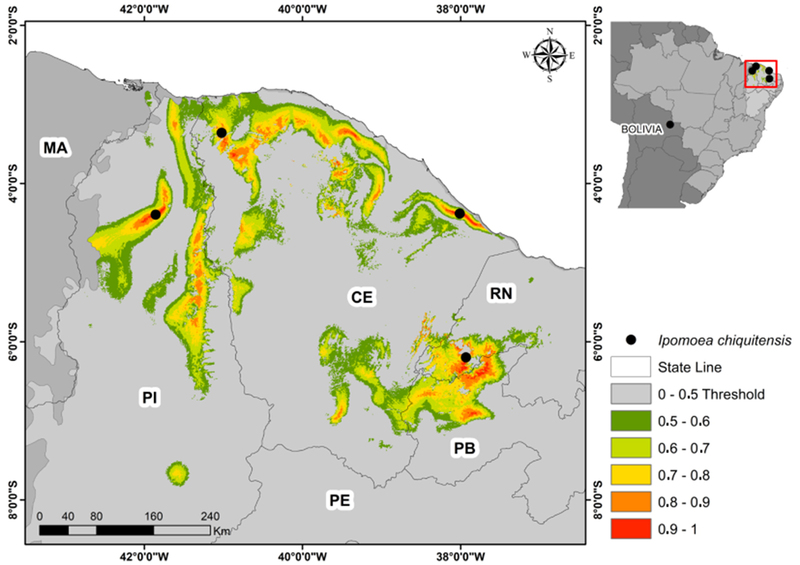 We also provide a species distribution model to help identify potential areas of occurrence in the northeast of Brazil. Specimens were collected following the usual techniques for taxonomic studies proposed by Mori et al. (1985) and deposited in the herbaria PEUFR and HUVA. We also consulted the collections at EAC, HCDAL, HUVA, PEUFR, HST, IPA, HVASF, UFP, MOSS, UFRN, HUEFS, as well as on-line databases (INCT, 2009; Reflora, 2010). For accurate identification, specimens were compared against the protologue (Wood et al. 2015), and type specimen photographs (isotype K). The terminology used to describe the collected material is that proposed by Harris and Harris (2001), and Hickey (1974) for venation patterns. Distribution maps were constructed with the new records in addition to the ones previously cited in the literature, using the software DIVA-GIS (Fig. 1). The conservation status was reevaluated using GEOCAT (Bachman et al., 2011). For modeling, we collected 23 environmental layers with spatial resolution of 1 km² (Table 1) and we selected predictors of environmental variables through principal component analysis (PCA). For that, we obtained the data of the 23 environmental variables in each pixel of the background (Caatinga), using the geographic information systems (GIS) software QGIS. For each PCA component we selected a predictor, one that maximized the percentage explained by the component (Table 2). The predictive variables selected by the PCA were: average temperature of the coldest quarter (bio11), annual precipitation (bio12), precipitation seasonality (bio15), and aridity index (ia). To compute the PCA we used the software R (R Core Team, 2016), Vegan package. We chose the environmental distance— DOMAIN algorithm (Carpenter et al., 1993) for the construction of our models. The models were computed in Open Modeller 1.1 software (Muñoz et al., 2011). We used the binomial test to evaluate the performance of independent models (Pearson et al., 2007). The binomial test was performed in BioEstat 5.0 software (Ayres et al., 2007). Ipomoea chiquitensis J.R.I. Wood & R.W. Scotland. Type. Bolivia, Santa Cruz, Velasco, 6 – 10 km N de San Rafael em el caminho a San Miguel, 16°43’55” S, 60°44’29” W, 420 m, 04/04/2011 (fl., fr.) J..R.I. Wood & D. Soto 27388 (holotype USZ; isotypes K!, LPB). Nomenclature, abbreviation, download site, and source of the bioclimatic layers used in model computation. Description. Herbaceous vine, branches sparsely hirsute, internodes 2-15.5 cm long. Leaves simple, 1.8-6 × 3-6.5 cm, cordiform, the margin entire, the base cordate, the apex acuminate to cuspidate, mucronulate, blades discolorous, herbaceous, abaxial surface glabrous, adaxial surface sparsely hirsute; venation brochydodromous, with 5-6 pairs of secondary veins and white dots along the veins on the abaxial surface. Petiole 2-5 cm long, hirsute. Inflorescence 1-floral, axillary, peduncle 3-6 mm long, hirsute; pedicel ca. 9 mm long, glabrescent, bracteole ca. 1 mm long, lanceolate, glabrous. Calyx with sepals subequal, the outer ones 5-6 x 2 mm, oval to lanceolate, margin entire, the base truncate, the apex acute to acuminate, glabrescent, the inner ones 4-5 × 2.5-3 mm, oval, margin hyaline, the base truncate, the apex acute, glabrous. Corolla 1.7-1.8 cm long, funnelform, glabrous, pink to lilac. Stamens inserted; filaments 3.5-6 mm long, with short trichomes at the base anthers 1.2 mm long, the base sagittate, apex obtuse, white; Gynoecium inserted; ovary ca. 1 mm long, conical, glabrous, 2-loculate, 2 ovules per locule; style ca. 7 mm long; stigmatic lobes verrucate, papillose. Fruit ca. 9 mm long, ovoid, glabrous. Seeds not observed. (Figs. 2, 3). Material examined. Brazil. Ceará: Graça, Sítio Santa Clara, 04°22’45” S, 38°00’36” W, fl., 08-V-2016, F.F. Araújo 24 (HUVA 21151, EAC 3424, PEUFR 52969); Granja, Distrito de Santa Teresinha, Cachoeira de São Miguel, 03º21’33” S, 41º01’16” W), fl., fr., 03-VI-2016, E.B. Souza 4140 (HUVA 20856). Piauí: Piripiri, 04°23’35”.2 S, 041°51’21” W, fl., 12-VI-2016, J.A.A.M. Lourenço 124 (PEUFR). Rio Grande do Norte: Portalegre, 6°11’50” S, 37°55’54.16” W, fl., 22.04.2016, A.M. Marinho 256 (PEUFR). Conservation status. Based on IUCN criteria, the species is classified as endangered (EN). Note. Specimens of Ipomoea chiquitensis have been identified as I. acanthocarpas (Choisy) Aschers & Schweinf. due to the very short corolla. However, I. chiquitensis can be easily distinguished by its slender stems, herbaceous leaves, short peduncle, long pedicel, inflorescence reduced to one flower, and smooth sepals (Table 3). Figure 2. Ipomoea chiquitensis. 1) Slender stems; 2) corolla; 3) side view of fruit; 4) calyx persistent in fruit (F.F. Araújo 24). Photos by F.F. Araújo, except 1 by F.D.S. Santos. Figure 3. Ipomoea chiquitensis. A) Branch with leaves and a flower; B) sepals detail; C) corolla detail; D) fruit. Regina Carvalho picture based on F.F. Araújo 24. Ipomoea chiquitensis occurs in Bolivia (Wood et al., 2015) and in the Brazilian northeast, where it grows in sandy soils, mostly disturbed areas, and in shaded sub-deciduous forest borders. This habitat is different from the type locality in Bolivia, where the species grows on islands of vegetation over rocky soils. This disjunct distribution between Caatinga and Chaco has been reported for other species of Convolvulaceae (Buril et al., 2014). Wood et al. (2015) categorized the species as critically endangered (CR). The new records from the Brazilian northeast change its status and here we categorize it as endangered (EN), according to the IUCN criteria. Eigenvalue of environmental layers for the 4 significant axes of PCA. The evaluation of the potential distribution of Ipomoea chiquitensis showed that it may occur in other areas of the northeast region of Brazil, because the results indicate the areas that are favorable to the occurrence of the taxon. The environmentally adequate area of the species from the model was 70594.97 km², equivalent to 8.53% of the background (Fig. 4). 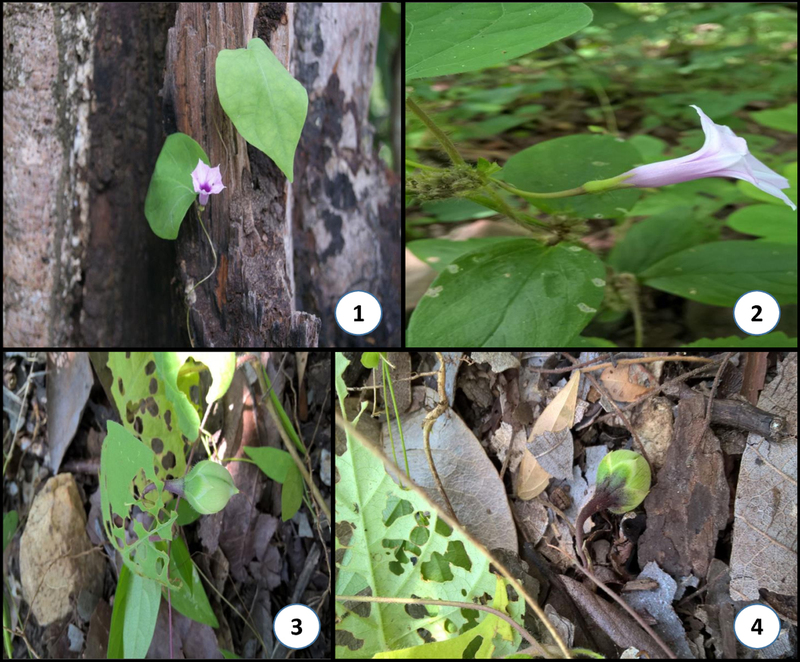 Overall, the discovery of the new records of I. chiquitensis come to support the already suggested relationship between the flora of Chaco and Caatinga (Buril et al., 2014), and highlights the importance of improving investigations of the Convolvulaceae in savannah vegetation of the Brazilian northeast. We acknowledge the financial support of the Conselho Nacional de Desenvolvimento Científico e Tecnológico for our field expeditions, under the project: “Sistemática de Convolvulaceae da América do Sul: construir em direção ao conhecimento global” (Process: PVE 314725/2014-8) and thank CAPES for granting a scholarship to the first and second authors. We thank Dr. Edson Gomes de Moura Júnior (UNIVASF) for providing the potential distribution model, and Regina Carvalho for illustration. Morphological comparison between Ipomoea chiquitensis and I. acanthocarpa in the Brazilian northeast. Figure 4. Potential distribution modeling of Ipomoea chiquitensis. Aryres, M., Ayres, M. J., Ayres, D. L., & Santos, A. A. S. (2007). Bioestat 5.0: Aplicações estatísticas nas áreas das Ciências Biológicas e Médicas. Sociedade Civil Mamirauá. Bachman, S., Moat, J., Hill, A. W., de la Torre, J., & Scott, B. (2011). Supporting Red List threat assessments with GeoCAT: geospatial conservation assessment tool. In V. Smith, & Penev, L. (Eds. ), e-Infrastructures for data publishing in biodiversity science. Zookeys, 150, 117−126. BFG. (2015). Growing knowledge. Mansano, V.F. An overview of seed plant diversity in Brazil. Rodriguésia, 66, 1085–1113. Buril, M. T., Maciel, J. R., & Alves, M. (2014). 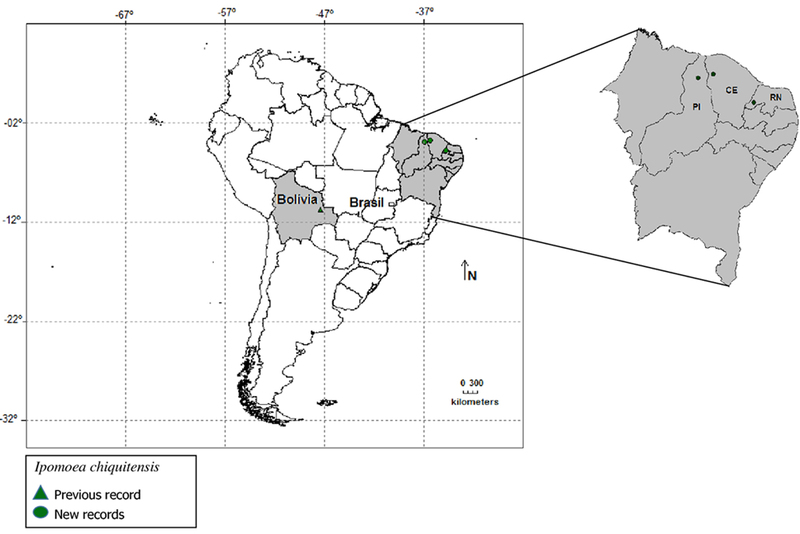 Distribution patterns and areas of endemism of brazilian Jacquemontia (Convolvulaceae) species. Edinburgh Journal of Botany, 72, 13−33. Carpenter, G., Gillison, A. N., & Winter, J. (1993). DOMAIN: A flexible modeling procedure for mapping potential distributions of animals and plants. Biodiversity and Conservation, 2, 667–680. Harris, J. G., & Harris, M. W. (2001). Plant identification terminology, an illustrated glossary. Hickey, L. J. (1974). Classificación de la arquitetura de las hojas de dicotiledóneas. Boletín de la Sociedad Argentina de Botánica, 16, 1−26. Hijmans, R. J., Cameron, S. E., Parra, J. L., Jones, P. G., & Jarvis, A. (2005). Very high resolution interpolated climate surfaces for global land areas. International Journal of Climatology, 25, 1965−1978. Mori, S. A., Mattos-Silva, L. A., Lisboa, G., & Coradin, L. (1985). Manual de manejo do herbário fanerogâmico. Ilhéus, Brazil: Centro de Pesquisas do Cacau. Muñoz, M. E. S., Giovanni, R., Siqueira, M. F., Sutton, T. Brewer, P., Pereira, R. S. et al. (2011). “OpenModeller: a genetic approach to species potential distribution modeling”. GeoInformatica, 15, 111–135. Pearson, A. T., Papes, M., & Eaton, M. (2007). Transferability and model evaluation in ecological niche modeling: a comparison of GARP and Maxent. Ecography, 30, 550–560. Simão-Bianchini, R. (1998). Ipomoea L.(Convolvulaceae) in Southeast Brazil (PhD. Thesis). University of São Paulo, São Paulo, Brazil. Simões, A. R., & Staples, G. (2017). Dissolution of Convolvulaceae tribe Merremieae and a new classification of the constituent genera. Botanical Journal of the Linnean Society, 183, 561–586. Valeriano, M. M. (2008). Topodata: guia para utilização de dados geomorfológicos locais. São José dos Campos, SP: INPE, Coordenação de Ensino, Documentação e Programas Especiais (INPE-15318-RPE/818). Wood, M. A., Carine, D., Harris, P., Wilkin, B., Williams, B., & Scotland, R. W. (2015). Ipomoea (Convolvulaceae) in Bolivia. Kew Bull, 70, 31–67. Zomer, R. J., Bossio, D. A., Trabucco, A., Yuanjie, L., Gupta, D. C., & Singh, V. P. (2007). Trees and water: small holder agroforestry on irrigated lands in northern India. IWMI Research Report 122. Colombo: International Water Management Institute. Zomer, R. J., Trabucco, A., Coe, R., & Place, F. (2008). Trees on farm: analysis of global extent and geographical patterns of agroforestry. ICRAF Working Paper No. 89. Nairobi: World Agroforestry Centre.